This week one of our NaturallyCurly contributors, Janelle Sands, is our special guest answering your curly questions on Curly Q&A. Janelle is an artist, teacher, writer, lover of women, and image consultant. She has 12 years experience in hair and beauty, and she shares that with women on her blog Secret Curl Society. When going natural a lot of changes happen. There is something called the "line of demarcation." That is the line between your natural hair and your relaxed hair. That line marks a distinctive difference based on the condition of your hair. 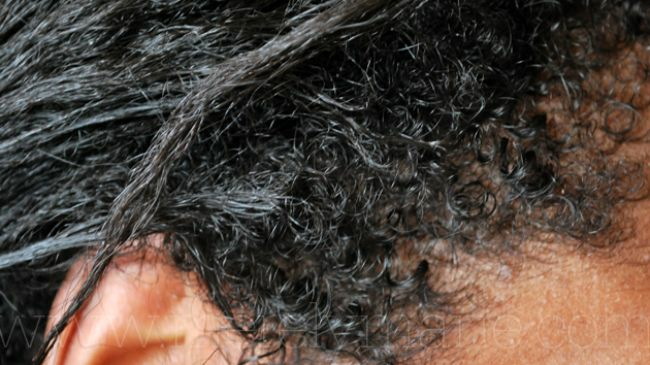 What might be happening is that your natural hair has different needs than your relaxed hair. So think back to how you cared or your relaxed hair. That is how you will continue to care for it. The relaxed hair needs more protein and the natural hair needs more moisture so be sure to give it what it craves. And now is the to adjust your trim schedule. Trim your hair every 6-8 weeks from here on out. This will keep your hair in better condition and speed up your transition process. Use a sulfate free shampoo or switch to a cleansing conditioner. If you'd like to know more about the difference between cleansing conditioner and regular conditioner you can read here. Finally after you cleanse and condition, use a leave in conditioner spray and seal with oil ( LOC METHOD) this should help you along the way. Hope this helps! If you have a question for Janelle, you can post it on Curly Q&A here.